The release of the UPCAT results for 2018 has been quite a hot topic for the past few days. In a Facebook post by UP Regent Atty. Spocky Farolan, Announced that the results will be released on April 30, 2018. He also addressed some of the concerns of netizens about the release of the UPCAT 2018 results. However, a heated and interesting discussion ensued in the comments section. Atty Farolan also received private messages and exchanges of strong words happened. This prompted the UP regent to send a letter to the UP Office of Admissions to clarify things. I have recently been in contact with a number of parents, guardians and applicants who took the UPCAT for academic year 2018-2019. They raised several issues, concerns and queries which, in my assessment, would indeed require our immediate attention, response and clarification. How many incoming first year students would the University of the Philippines accept this coming AY2018-2019? How does the number compare with admissions in 2015 and 2014? There are some universities which require incoming freshmen students to enroll on dates prior to the expected release of the UPCAT results. Can a student who enrolls in a different university prior to the release of the UPCAT results still be accepted as a student of U.P. if said student passes the UPCAT and withdraws his enrollment from the other university? Would the student be not disqualified? In relation to question no. 2, what are the required documents, original or certified true copies, which a student qualified to enroll in U.P. must submit? What are the deadline for its submission? Does current policies allow an extension for the submission of said documents in case the qualified student previously enrolled in a different university and would require time to retrieve the said documents? Is U.P. covered by R.A. 10648, otherwise known as the Iskolar ng Bayan Act of 2014, which grants the top 10 graduates of public schools automatic admission to state universities? If covered by said law, what are the guidelines of U.P. in implementing this law? When can qualified students start to apply in U.P. under this program? In relation to question no. 4, would a student who graduated among the top 10 of his school during Junior High School but failed to make the top 10 in Senior High School still be qualified to receive the benefits provided under the Iskolar ng Bayan Act? Where, when and how can an UPCAT non-passer get his or her UPCAT grade? As of receipt of this letter, how many UPCAT examination papers and grades have been computed? Do we foresee any challenges that could force U.P. to miss the target of releasing the results on or before 30 April 2018? It would be greatly appreciated if the response to my queries are made within two (2) days from receipt of this letter. You may course it through the Office of the University Secretary. Also, these are just some of the concerns raised which I think need to be immediately responded to and clarified. A number of concerned parents, guardians and examinees have also provided suggestions and other concerns which we can discuss at a later time. Finally, you may have heard about issues regarding my social media outbursts in response to some unsavory remarks made about the UPCAT results and U.P., especially the people toiling to check and have the results released. I apologize for my temper and allowing my raw emotion to publicly come out unfiltered. Please do not let this distract you in the service you have been painstakingly doing for U.P. and the thousands of UPCAT applicants and their families. Rest assured that, though things may not always be ideal, you and your office will always have my support in this continuing process of improving our services. In response to Atty. Farolan's queries, the UP Office of Admissions sent a letter explaining point by point the issues he raised. *Transition years for K+12 program in which Grade 10 HS students were required to take Grade (in AY2016-2017) and Grade 12 (in AY2017-2018); UPCAT2016 and UPCAT2017 applicants were limited to students coming from HS that had DepEd-approved transition programs. 4. Is UP covered by R.A. 10648, otherwise known as the Iskolar ng Bayan Act of 2014 (INB ACT), which grants the top 10 graduates of public high schools automatic admission to state universities? Yes, UP is covered by R.A. 10648. Provided: That for the next six years in the implementation of this Act beginning SV2015-2016, admission their SVCs of choice within their region shall be automatic for the top ten (10) graduating students of public high schools. 5. In relation to no. 4, would a student who graduated among the top 10 of his school during Junior High School but failed to make the top 10 in Senior High School still be qualified to receive the benefits provided under the INB ACT? No, because a HS graduate must have completed Grade 12 along with other eligibility requirements. 6. Where, when and how can an UPCAT non-passer get his/her UPCAT grade? For UPCAT Non-Qualifiers, the notices are sent to their high schools which they can get even though they have already graduated. For those who wish to also get a second copy from the System Office of Admissions located in UP Diliman (there is a Php50.OO fee for the second copy). 7. 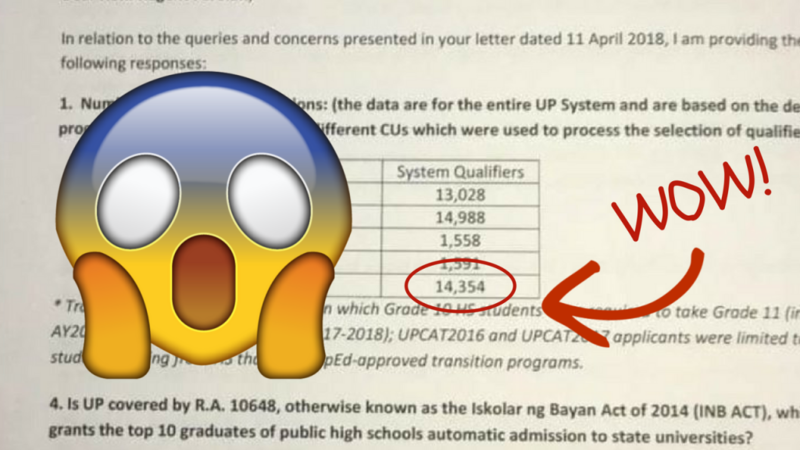 As of receipt of this letter, how many UPCAT examinations papers and grades have been computed? All the exam papers (n = 78,974) have been checked, validated and have undergone item analysis. I cannot give a number to say how many grades have been computed. The HS final grades are being processed using 3 stages of operations to ensure integrity & validity before merging with the exam scores to compute the UPG. 8. Do we foresee any challenges that could force UP miss the target of releasing results on or before 30 April? No major challenges, except the sheer volume of data and the recent brownout last Tuesday from around 4pm-8pm (our generator is out of order but we already started the procurement process). Please see attached for answers provided by the UP Diliman OUR to Question numbers 2 and 3. Until the results are released, we believe the confusion and anticipation will continue. Hopefully, through this correspondences, some of your questions have been answered. What do you guys think? Please share your thoughts in the comments section. Is UP Tacloban included in the Free Tuition law? Do UP officials check the applicants’ grades in Math/Science/English from first to fourth grading? Or they will only mind the applicants’ final rating from 7th to 9th grade? UP gets the final grade for EACH SUBJECT for each year (grade 9, 10, 11-1st & 2nd sem).